Can anyone explain to me why baby mobiles are so expensive? I understand it more so for the ones that play music and such, but there seems to be a huge markup on the simple ones. If you follow me on Pinterest, you may have seen some mobiles that I pinned for the baby's room and there are a bunch on Etsy that I would have loved to buy, but I just couldn't justify paying $50 to well over $100 for something that I could make. What I did get from looking at a lot of mobiles was a really good idea of what I wanted for ours. First I wanted to stick with the theme of the room so I wanted animals and I wanted to bring in the brown/white theme. 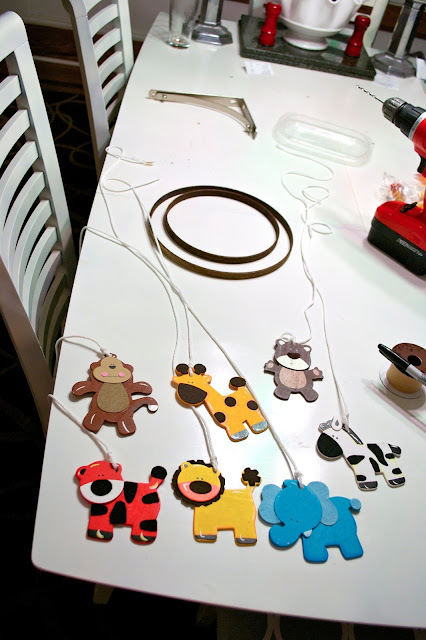 I also wanted the animals to be colorful and I wanted the mobile to be able to move without getting tangled. I took the inside hoops of the embroidery hoops and had Nate stain them while I drilled holes into the wooden animals (I put the hole at a point where the animal wouldn't tip to one side or another) and attached a piece of rope. 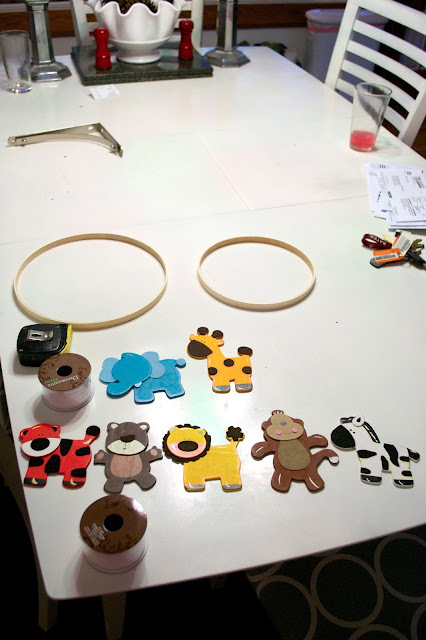 I then tied the rope of each animal to the hoops and tied all the ropes together. 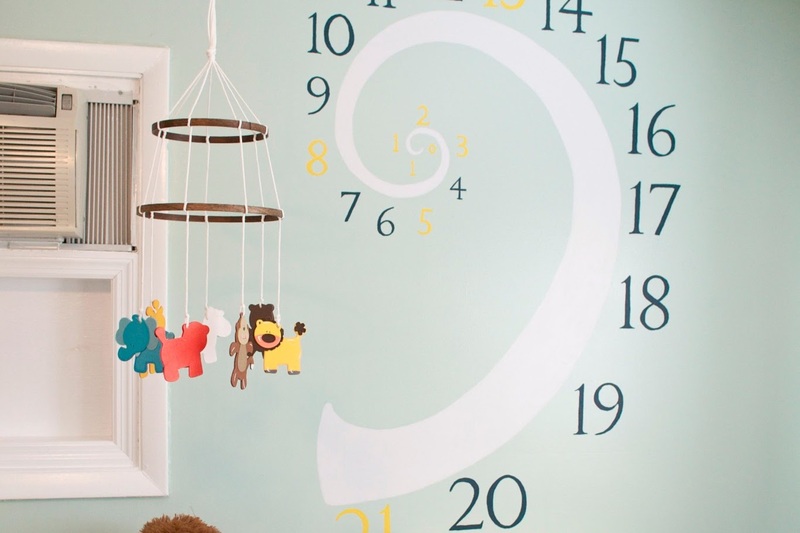 We installed a simple hook in the ceiling and hung the mobile so that it can be seen from both the changing table and the crib. It's a really basic mobile but it's perfect for our needs. One of my favorite things is that when the overhead fan is on in the room, the mobile slowly rotates, continuously, back and forth and the double hoops make it so the animals can't get tangled. The hoops were $1.29 and $1.49, the animals were $.67 each and the white rope was BOGO so for the two it was $1.99. We already had the stain and drill/drillbits so all in all we spent just under $9.50 for the mobile and it took about an hour over two nights to put it all together. This was the design we chose, but there are a ton of different options at craft stores if you get creative and don't want to spend a lot on a mobile. 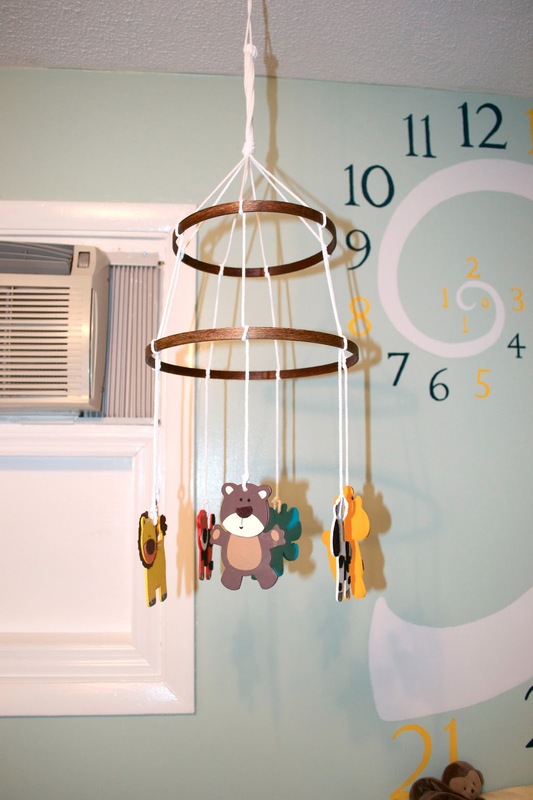 Very nice mobile and all the more special because Mommy made it!